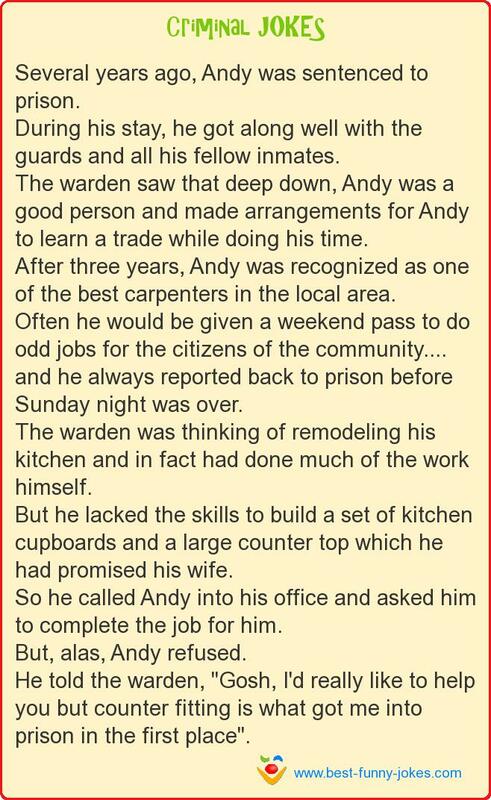 Several years ago, Andy was sentenced to prison. During his stay, he got along well with the guards and all his fellow inmates. and he always reported back to prison before Sunday night was over. The warden was thinking of remodeling his kitchen and in fact had done much of the work himself. But he lacked the skills to build a set of kitchen cupboards and a large counter top which he had promised his wife. So he called Andy into his office and asked him to complete the job for him. He told the warden, "Gosh, I'd really like to help you but counter fitting is what got me into prison in the first place".